PACKAGING: 4/5 - Sleek and chic. Simple amber and gold jar with pump. Candy for your cabinet. Plus, the double-chamber packaging and chose-your-own-dosage pump is brilliant. FRAGRANCE: 4/5 - Subtle. Clean and slightly sweet. Background scent - not overwhelming. FEEL: 4/5 - Glides onto skin rich and velvety. Slightly sticky on hands. IMMEDIATE EFFECT: 5/5 - Silky skin! LONG-TERM USE: 5/5 - Two weeks in: Smooth, bright and firmer skin. PRICE: $$$ - $89 makes this a luxury splurge. But, it's cheaper than a facial. FINAL WORD: Ultra-effective anti-aging ingredients, also great as an early preventative treatment. Worth it. Treat yourself. Clarins Double Serum, c/o Clarins. You want to know what's better than a face serum? A Double Serum, and Clarins, which has been perfecting theirs since 1985, just released their next generation (read: freshly updated) version of the good stuff earlier this year. Clarins Double Serum ($89) packs two anti-aging and skin-perfecting serums into one sleek little amber tube with lots of natural ingredients like turmeric (anti-aging, anti-inflammatory), oat sugars (refines skin texture) and chestnut. Choose your own adventure: Tiny Drop or Power Shot. If you love to cook like I do, you'll definitely appreciate the science behind the packaging. The hydro-lipidic formula is stored separately in the tube, coming into contact only when you pump it out and mix it between your hands before smoothing it onto your skin. It ensures that every application is, essentially, a fresh batch. The reason behind the water-oil combo? Simple. Some ingredients are water-soluble and some are oil-soluble. Great for your skin, but not great stuck together in a tube together for its entire shelf-life, so, just like the song says: Gotta keep 'em separated. Genius. Also genius is the choose-your-own-adventure dial pump, so you can select a Tiny Drop, ideal for combination to oily skin, warm or humid climate and summertime in general, or Power Shot, best for Normal, dry or sensitive skin, cold, dry climates, and winter. I've been rocking Power Shot even though it's September and still somewhat summery, because I can't get enough of how ridiculously quenching it is and how velvety-smooth it makes my skin feel - a perfect, even base for moisturizer. Sometimes I even wait until I finish the rest of my getting ready routine (mostly wrestling with my hair) to put on moisturizer because I want to give my skin as much time with the serum as possible. The only less than positive note I have about the Double Serum is that it is ever so slightly sticky on my hands, even though it absorbs smoothly onto my face. I imagine this tube will last about a month to a month and a half, so the nearly ninety dollar price tag definitely bumps it up to the luxe category, but it's still cheaper than a facial and just as effective. In any case, in the couple weeks since I started using it religiously, it's become an indispensable part of my beauty regimen - I even brought it on my trip to Dallas, where, together with Clarins' Hydra-Essentiel SPF 15, it shielded me from the Texan sun, dry climate, and airplane air. Final consensus? Worth checking a bag for. At The Joule Hotel in Dallas, Texas enjoying a cappuccino and my moisturizing army, Clarins Double Serum and This Melting Body Oil. Clarins Double Serum in front of the Dallas Eye, right by The Joule Hotel. 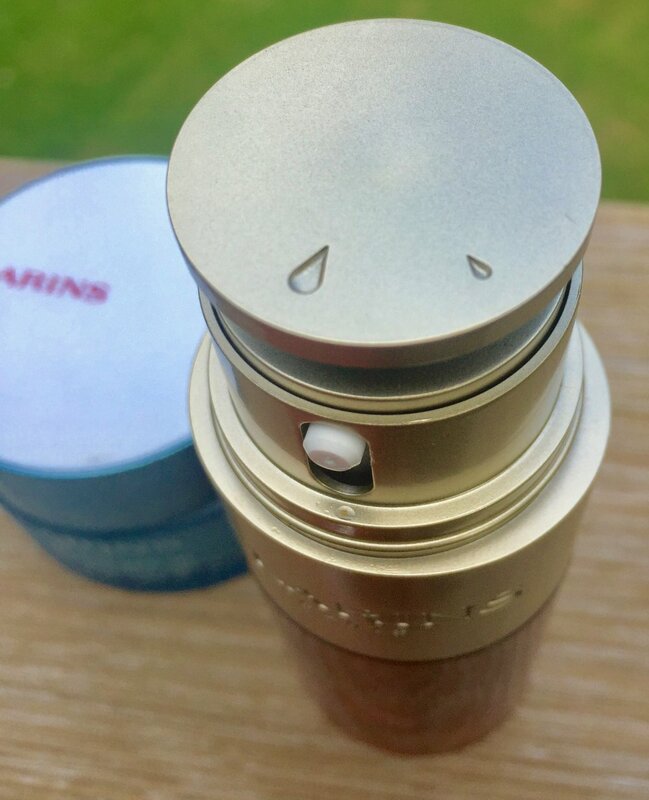 Read my review of Clarins Hydra-Essentiel SPF 15 Moisturizer. EDITORS NOTE: I received this product compliments of Clarins to give it an honest review.